December 26, 2007 By Michael Tan & filed under All Articles, Tactics/Training. It’s dusk. 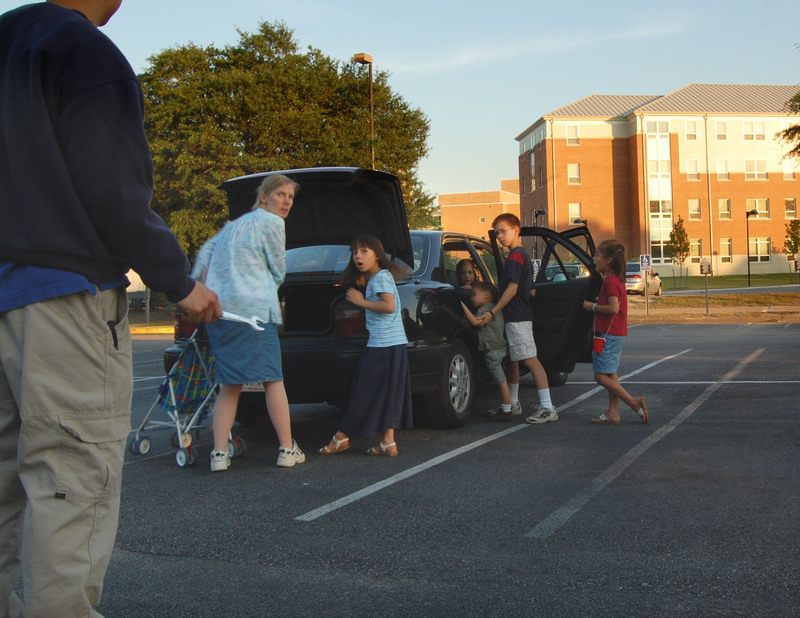 You’re in the grocery store parking lot with your children and spouse, loading your trunk as the children are clambering into the car. A beat-up car with three suspicious-looking men drives down your row and stops behind you and your car. They’re not looking for a parking space. In this article, we’re going to examine your options for meeting an attack at various ranges. 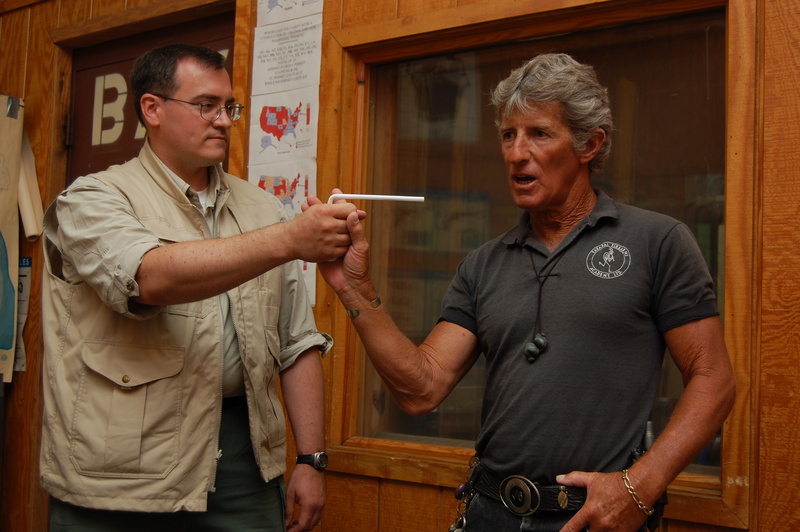 Louis Awerbuck demonstrating one of many simple disarms. People who take an interest in armed and unarmed self-defense come to the problem with a number of options. You may carry a handgun. You may have at least one folding knife on your person. You may be trained and skilled in some unarmed martial arts system. Perhaps you have theater experience and have some canned ruses at the ready. You may be in good physical shape, able to run miles at a good clip. And what about pepper spray? And your electro-zapper, which you’ve never gotten up the nerve to try on yourself (though you came thiiiiis close to convincing your brother-in-law to let you try it on him)? And what about a quick prayer for Divine deliverance? I’ve just listed nine possible options for dealing with an armed confrontation. That’s too many to process. When you’re staring at a gun muzzle rammed into your gut, you don’t need a multiple-choice test. Three circles: Inner Circle is red, Middle Circle is blue, Outer Circle is green. Who knows what will happen, should these hypothetical scenarios ever become reality for you? Louis Awerbuck is fond of reminding students that the outcome of a fight is 95% dependent on things outside of your control, no matter how cool your tools are and no matter how honed your skills are. This is not to say that it’s pointless to prepare and train. It’s just a reminder that you had better be right with God if you get into a fight, even if you can shoot and move with the best of them. We’re going to limit ourselves to examining the following variations of the problem: Your mobility, your range to the bad guy and the immediate nature of the threat. Mobility refers to your ability to put physical distance between yourself and the confrontation. It may be hindered by environmental factors: Are you with children? Are you in a narrow hallway, blocked in? Are the bad guys aggressively charging? These and other factors may prevent you from being mobile and increasing the distance between you and the confrontation. Range to the bad guy refers to the distance between you and the bad guy. It could be six inches or it could be 26 yards, but it’s not likely to remain static throughout the confrontation! Finally, the immediate nature of the threat refers to how the bad guy is intending harm—is he empty-handed, or is he wielding a knife or a gun? Whatever you see or don’t see in the bad guy’s hands, assume that he has something. Dividing the problem into distances is the easiest way to get a handle on it. I propose that the following three circles or zones be used to define the problem. Scrambling to survive in the Middle Circle. Let’s start with the closest distance—grappling distance. We’ll call this the Inner Circle. At this range, the bad guy has his hands on you or can take a step and be on you. This is arm’s length plus one step. In some ways this is the worst case, but it is also a simple case. Look at the nine options listed above. At this range, there are only two things that make sense as default responses. Remembering that you don’t know how the bad guy is armed, stop reading for a minute and decide what you would default to at this range. Your gun? Your knife? Here’s my answer: The default response at this range should be to run—get away! If the bad guy is attacking with empty hands or a knife, this may be the preferred response. Problem with employing your gun at this range: you cannot get it out fast enough. If you don’t believe me, get a plastic gun, put the gun in its concealed position, and have an unarmed buddy initiate an attack on you with a rubber knife at this distance. I’ll bet he can get in five “cuts” across your vital areas before you get the gun on target. Problem with employing your knife at this range: Ah, yes, the knife option. You’ve probably read that at this distance, a knife can do more damage than a gun. That may or may not be true, but it assumes many things. First, it assumes you’ve managed to get your folding knife deployed. That’s a big if. Secondly, it assumes that it is better to have only one hand free to defend against a bad guy. However, every instructor I’ve seen teaches two-handed methods for disarming/defending against an attacking gun or attacking knife. 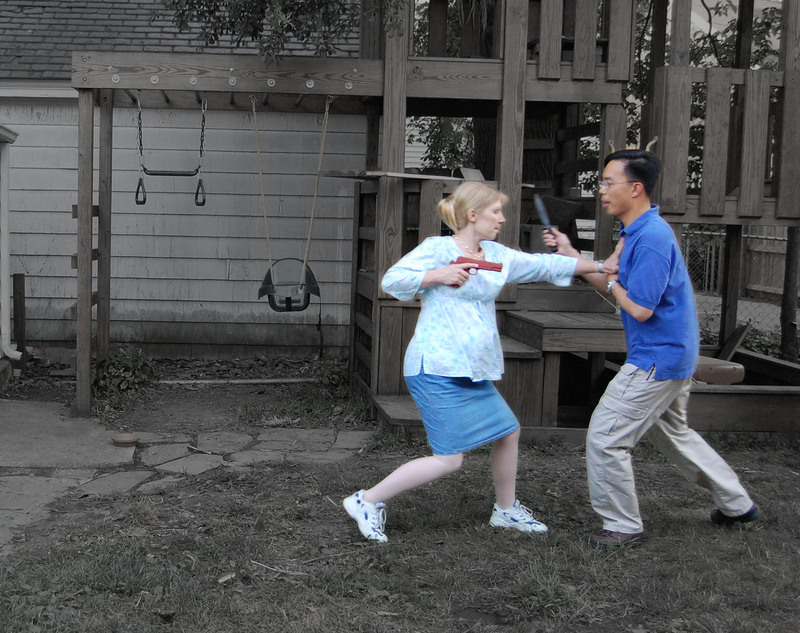 Planning on attempting a disarm against your armed attacker? You need two empty hands. You can’t do it with just one hand while the other is holding your knife. To top it off, nobody I’m aware of says that knife-on-knife is a good thing. You often end up with two losers in a knife-on-knife fight. About to be overrun in the Inner Circle. What about pepper spray? At this distance you may as well spray yourself in the face! How about the ASP baton? You still have to deploy it, and the bad guy is only one or two quick steps from getting inside the radius of your swing. And the TASER? What if the bad guy has a knife or screwdriver? Unless you can shoot a TASER out of your forehead (now there’s a piece of tactical gear that would sell! ), we’re back to the one-handed problem discussed above with knives. Now, of the nine options we listed at the beginning of the article, they all have their place, and can even succeed in some confrontations. I’m not saying they can’t or won’t work. But personally, I’m most interested in the solution that I can more reliably default to without having to do a full cost-benefits analysis when I’m thrown into a real-life confrontation. Of the two responses I listed for a confrontation at this range, neither is pleasant to imagine if you’re faced with a gun or a knife. Ultimately, you’ll have to decide which route you personally want to take as your default response. The goal at this range is to survive, overcome and, if possible, break away to a more distant zone. This may involve a shove-off or neck strike followed by immediate movement. It may involve retention shooting. Avoid the mistake of primarily defaulting to a gun or knife at this range. Now let’s increase the distance to the bad guy. I’m going to skip the Middle Circle for now and discuss the Outer Circle. This is “shooting distance.” We’re talking about the range at which you have enough time to deploy your gun and use it without being overrun, stabbed or grabbed by the bad guy. How far out is the Outer Circle? 21 feet? Well, this is where it gets a little murky. If you gradually increase the distance between you and the bad guy, at a certain point, you finally have the bad guy far enough away that you could (a) mentally respond (recognize the bad guy as a lethal threat), (b) complete a drawstroke from concealment, and (c) fire a round onto target without being overrun. You might think that the distance we’re talking about is simple—just add up the time it takes to perform (a) + (b) + (c), right? Wrong. You should be moving as this happens. Depending on the variables limiting your mobility, you may or may not be moving laterally or backward. Furthermore, the bad guy may also be moving. We can’t come up with a hard number for the start of the Outer Circle. It’s determined by the specific environmental factors of a given confrontation, your personal drawstroke speed from your method of concealment, and the dynamics of the confrontation. Having explained that, it is still useful to time yourself responding to a visual cue and drawing, which will give you an idea of where your Outer Circle may start. The bottom line is, this zone starts at a distance that is pretty far from the bad guy. If the confrontation starts with you in the Outer Circle, then you have time to deploy and use your gun. In the parking lot example that we started with, if the bad guys are on the other side of their car when they pull out a knife, you might be starting in the Outer Circle, given that they must circumnavigate their car before they can get to you. What are your options in the Outer Circle? I would suggest that your default response should be to deploy your gun at this range, but let’s examine the other options. Running is a good option here, if your mobility is not compromised. A knife, an ASP, martial arts, and pepper spray are not the best options. You need a ranged weapon at this distance. A TASER could work, but what if you miss? What if there are three bad guys? If you “go to guns” at this range, you still need to be moving off the line of attack and moving to cover. If the bad guy has a gun, you don’t want to stand still for him. If the bad guy has a knife, he can charge you. Though you may start the confrontation at this distance, the bad guy can flip you from the Outer Circle to the Inner Circle in 1.5 seconds. Footwork is still essential in the Outer Circle. Practice accordingly! Between Grappling Distance and Shooting Distance is a no man’s land—a transitional zone. In this zone, you can be stabbed or grabbed or shot as you go for your gun (or blade, or spray, or baton, etc. ), but you’re also too far from the bad guy to get your hands on him. We can’t define the distance in an exact number of feet, but if the bad guy is pointing a gun at you, and you are three steps away, you’re probably in the Middle Circle. In this middle zone, you have to make a choice. You have to decide to either a) commit yourself to get into the Inner Circle, or b) commit yourself to attempt to get to the Outer Circle. Let’s be clear about this. In the split second in which you make the decision, there is no way to know the right answer. You may decide to close the distance, trip, and accidentally impale yourself on the bad guy’s knife. You may decide to run left, making distance, and end up walking right into his bullet. There are no guarantees. However, if you stand and dither, you’re giving the bad guy the opportunity to take the initiative, and that is something you don’t want to do. If he has a gun, he will have a harder time shooting you if you are moving. Commit yourself and execute. Get out of the Middle Circle. 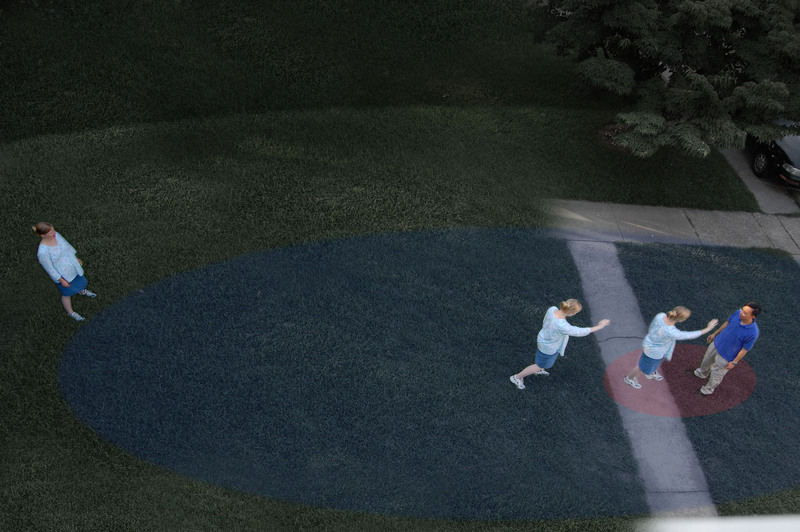 In the Middle Circle, closing the distance and charging the bad guy are arguably easier to do. Once you get into the Inner Circle, you’re not necessarily going to have an easy time of it, but getting into the Inner Circle is probably easier than getting to the Outer Circle. To get to the Outer Circle, the goal is to make more distance. Footwork is very important here. If you can move laterally off of the line of attack, try that. Due to mobility restrictions (a wall, your wife, etc. ), you may not be able to go that way. In all likelihood, if the bad guy is charging, you are probably going to get hit or cut while you are in the Middle Circle. If you decide to attempt to get to the Outer Circle, go for your gun while you move, even though you can be grabbed or stabbed in the process. If you make distance and get to the Outer Circle, great! You’ll also have your gun in hand. If you fail to get to the Outer Circle and you are overrun in the Inner Circle, this is where shooting from retention comes in. Shooting from retention is not something that you should default to at the start of a conflict when in the grappling range. Rather, it is something that you resort to when a situation deteriorates: namely, you’ve managed to get to your gun, but in spite of your footwork you get overrun by the bad guy(s). Shooting from retention may also be your first move to disengage and move out of the Inner Circle. Let’s summarize the theory and the recommended default responses. If the fight starts in the Inner Circle, get away or go hand-to-hand. If the fight starts in the Middle Circle, move! Either close the distance and get to the Inner Circle, or make distance and get to the Outer Circle while going for your gun. If the fight starts in the Outer Circle, move and go for your gun. In setting forth this three-circle theory, I’m not claiming originality. I’ve been blessed to have trained under some of the current luminaries of the training world, and I’ve also spent lots of time trying to read and digest the wisdom of those trainers. I heartily point you to men such as Clint Smith, Louis Awerbuck and Jeff Gonzales. This is a student’s attempt to lay out a simple, logical first move in the chess game of deadly confrontations. Stay one step ahead in the chess game of deadly confrontations by planning your first move in advance.